Let's have a little fun, then I'll attach my dry trail description at the end. 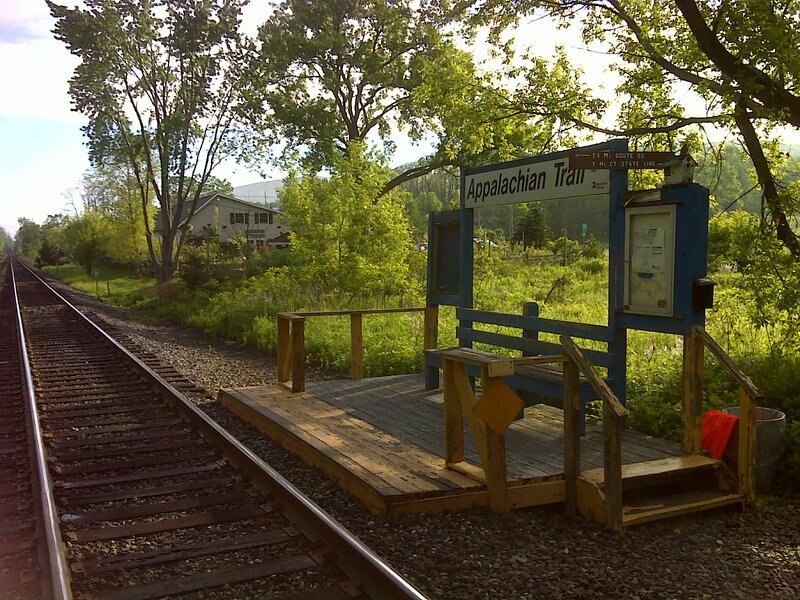 Here's probably the only place you can get a train directly on the Appalachian Trail. Hike to here and the next thing you know, you're off to Istanbul. 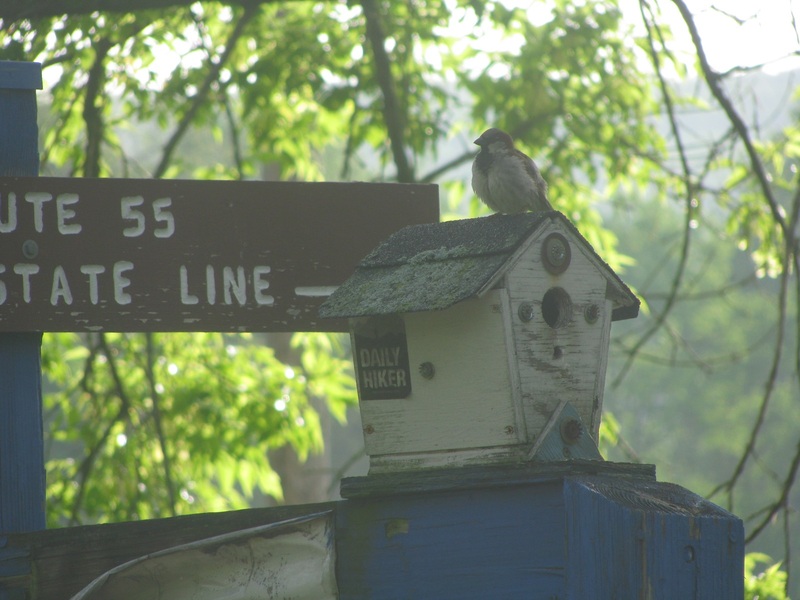 Did you notice the bird sitting on the roof of his house in the above photo? Trash trash. 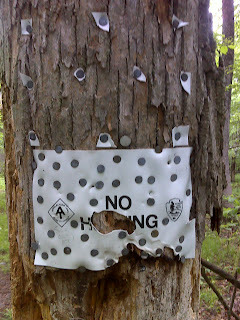 The trashiest place on the AT (Springer to here). Grab some buds, maintainers ... underage drinkers are not going to pack out the evidence. This beautiful vista needs to be better patrolled. Whale Rock. I named it that ... don't know the name it's given by the locals, if any. Maybe 'Moray Eel Rock'??? Okay ... humans are man-made, no? Here's 'Bomber' and his rubber chicken 'Henry'. The second thru hiker I've met twice, two months - to the day - separating the two meetings in both cases. I dressed and headed out a bit after 7:30. It was already summery humid and warm, with the temperature overnight never lower than the low 60’s and dew point to match, obviously. 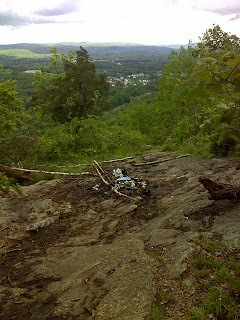 The hike was interesting from the start and remained so most of the leg south. I first had a road walk past a nursery and landscaping business, which, I’m told, offers free showers to hikers. Then the trail leaves Highway 22 at the Appalachian Trail Metro-North stop, only used on weekends and holidays. 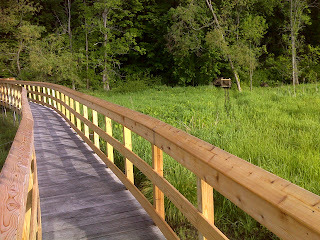 Beyond the tracks there is nearly a half mile of spanking-new boardwalk over Swamp River and its attendant broad swamp. There’s even a beaver pond with huge lodge right near the boardwalk. The trail then climbs a small mountain, Corbin Hill, in the woods and descends the other side in fields with scenic views of a rock outcrop on a ridge to the west. While crossing these fields I met ‘Bomber’ again. We had a very nice chat and took each others’ photos. I hope I can follow his progress as he continues north. At the bottom of this field walk, the trail passes Dover Oak – a huge old white oak of massive girth, supposedly the biggest on the trail – right beside West Dover Road, county highway 20. 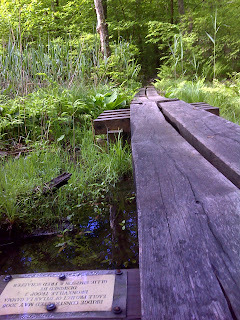 Then there’s a little swamp crossing before the significant ascent begins. That ascent starts on a slippery-when-wet bedrock spine. Why they relocated the trail there escapes me – the old trail is visible passing over normal terrain just to the left as you ascend. 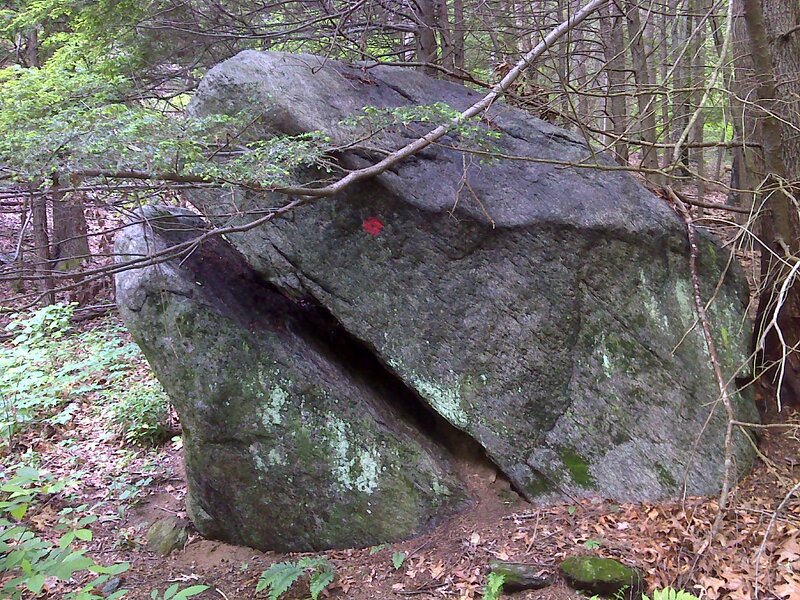 I suspect it’s pure laziness – bedrock is easier to ‘fix’ than erosion on the old trail. That sketchy bit only lasts a couple hundred yards though, and then the ascent is on normal trail, aka soil, and is fairly easy. It’s interrupted before the summit by the side trail to the Telephone Pioneers Shelter – no historic significance to the name, it was just sponsored by the local chapter of the Telephone Pioneers of America when it was built in 1988. I stopped in there and took a photo and signed the register as I do at every shelter. I had the place to myself, but as I was leaving, the same couple who I’d met at Morgan Stewart Shelter yesterday at lunch time, were arriving to take a break. Remembering my first impression from yesterday, I was a little guarded. But today these two were pleasant company. 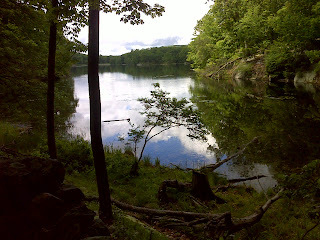 We chatted for just a few moments and I learned their trail names: ‘Day-Glo’ and ‘Blue Bird’, section hiking from Del. Water Gap to North Adams, MA. There was a beer-can-littered illegal campfire site right near the viewpoint – dozens of cans – more trashy than any spot I’ve encountered anywhere on the AT between here and Georgia. Underage drinkers are *not* going to pack out the condemning evidence, so somebody has to patrol this area better. 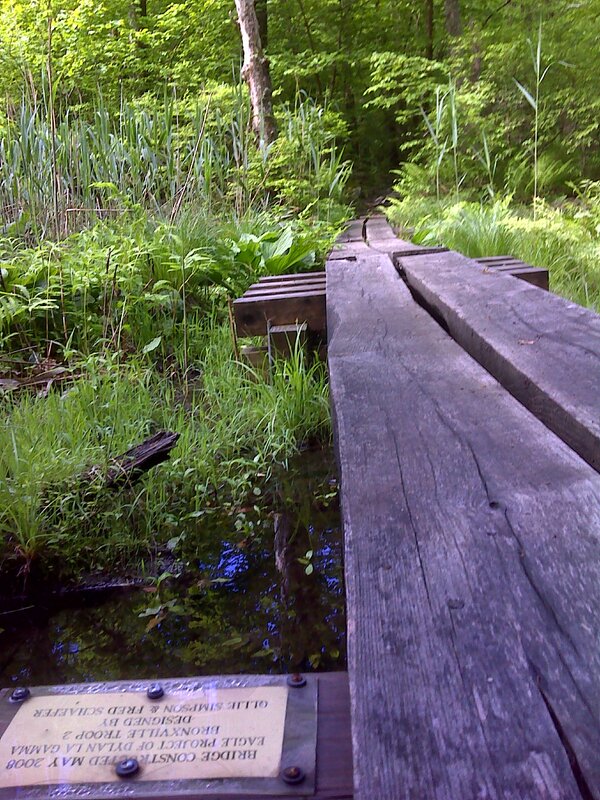 From the summit the trail gradually descends, passing a couple of side trails and an Eagle Scout constructed bridge over a significant swamp area. Finally I reached my turn-around point at Nuclear Lake and had a chance to linger there again on a nearly calm, humid, summery late morning. On the hike back I finally ran into the late-60’s-ish couple who own the red van with NC plates that ‘Scooter’ is shuttling. They’re a very nice pair, excited to learn of my way of hiking. I was especially impressed by the smiling eyes – very pleasant people. Tomorrow is their last day on the trail for the year. Each year since 1990 they’ve hiked a section, starting in Springer and steadily working north. Next year they hope to do all of CT and MA. I got back to the NY 22 parking area at 1:30, just as a few sprinkles were beginning to fall. I checked the radar – good internet reception there at the parking area – and it looked like a quick, insignificant shower that would quickly be finished. So I might have headed out right away, except for the fact that I was deliberately taking things a little easier since my ‘watershed’ reassessment and three zero-days. Instead I chose to have some lunch and rest a bit. And that turned out to be a very good choice, because by 2:30 the skies had opened up. There was a nearly stationary shower that had developed, mostly to the south, that was just endlessly dumping heavy rain here. I’m guessing that ‘Bomber’ had already gone far enough north that he missed this shower completely. But I was obviously not going to go out and hike in that. It lasted for more than an hour as I had more lunch and then napped to 4PM. I still had thoughts of doing the planned short leg north in the evening, but it was still dripping rain at 4:30, so I decided to settle for this short under-quota day and use the time to catch up on the blog writing and publishing. And that I did with this long post. And I'm back on an even keel, ready for an early start tomorrow. Hope the weather co-operates. 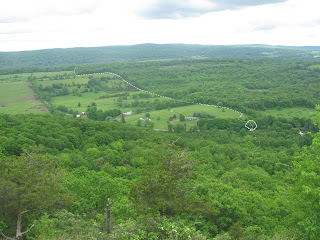 Below is a map of my hike today. The title is a hot link that takes you to 22 photos taken along the route. I wanted to post a quick blog about your trip. See the rough copy below. Is everything correct? 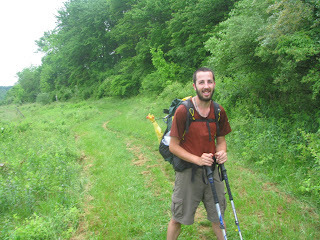 A Facebook message informed me that P J Wetzel has officially hiked more than 2000 miles of the Appalachian Trail this year, as of May 9, 2012. “It's a big milestone, and yet it's not even half of the 4368.4 miles I must hike this calendar year to achieve my goal: to be the first person to hike the entire AT both ways in one calendar year without ever spending an overnight on the trail,” Pete wrote. Reading about his adventures on the trail reminded me of Bill Bryson’s A Walk in the Woods, which I read several years ago The book was a hilarious account of Bryson’s walk along a portion of the Appalachian Trail. I found it hilarious, as well as educational and read several more of his travel books. Pete is doing the entire, Appalachian Trail, which is a 2,181-mile long public footpath that goes through the Appalachian Mountains. 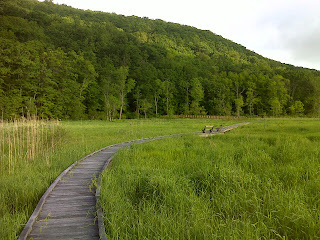 The Appalachian Trail is a. Conceived in 1921, built by private citizens, and completed in 1937, today the trail is managed by the National Park Service, U.S. Forest Service, Appalachian Trail Conservancy, numerous state agencies and thousands of volunteers. The trail is maintained by the National Park Service, U.S. Forest Service, Appalachian Trail Conservancy, numerous state agencies and thousands of volunteers. It is long, rough, often lonely walk and offers a challenge to hikers. Pete has traveled through cold, snowy and icy conditions and also through beautiful sunny days. He spent many solitary days along the trail, but also met a wide variety of people during the hike. His pictures, factual information and insights, make me feel I am traveling with him, but without the discomfort. Let’s hope so. I met Pete through the Eldersburg Critique group. He is a writer, a climate scientist and a hiker. Will Pete combine his notes together and publish a book? He should. 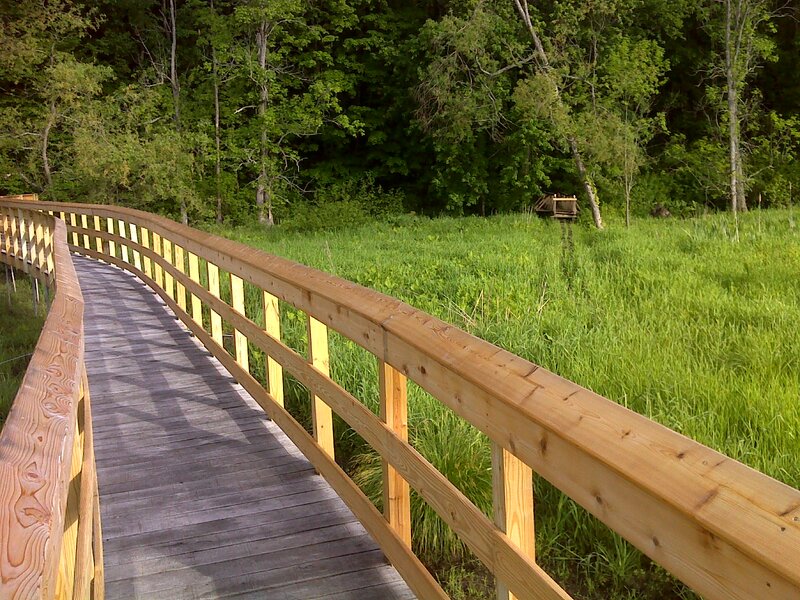 He includes lots of details that make the walk personal. Unfortunately I haven’t been able to read all the entries, but I found those I read very insightful and would look forward to reading a book about the trip. Pete has been sharing these experiences with us through Facebook. You can check out his reports at www.pjwetzel.com.